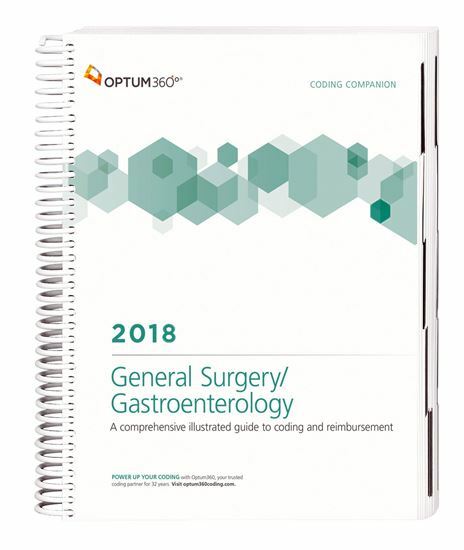 Consolidate the coding process with the Coding Companion, your one-stop resource developed exclusively for those who code for general surgery and gastroenterology. This comprehensive and easy-to-use guide includes 2018 CPT®, HCPCS, and ICD-10-CM code sets specific to your specialty. Each specialty-specific procedure code includes its official description and lay description, coding tips, terminology, cross-coding to common ICD-10-CM, and relative value units. Getting to the code information you need has never been so easy. New — Code icons. Quickly identify new, revised and add-on procedure codes related to general surgery and gastroenterology. New — CPT® Assistant references. Identifies that an article or discussion of the CPT code has been in the American Medical Association’s CPT Assistant newsletter. Use the citation to locate the correct volume. Optum360 Edge — HCPCS procedure codes. Only Optum360 offers HCPCS procedure codes specific to your specialty with the same information as we provide for CPT codes. Quickly find information. All the information you need is provided, including illustrations, lay descriptions, coding tips, terms, cross-coding, Medicare RVUs and Pub. 100 references. Organized by CPT® and HCPCS procedure code. Essential procedures for general surgery and gastroenterology are listed by CPT® or HCPCS procedure code, along with crosswalks to common ICD-10-CM diagnosis codes. Easily determine fees for your practice and reinforce consistency in the charges. Relative value units including the practice, work, and malpractice components with total RVUs for non-facility and facility for procedures are included. Avoid claim denials and/or audits. Medicare payer information provides the references to Pub. 100 guidelines, follow-up days, and assistant-at-surgery. CCI edits by CPT® and HCPCS procedure code. CPT® and HCPCS procedure codes with associated CCI edits in a special section and quarterly updates available online.